Police arrest two self-confessed lekki robbers . Two men arrested by police in their confessional statements, owned up to belonging to a syndicate terrorising Lekki and its environs. The suspects, Adebayo Ayomide, and Isaac David were arrested by a team of detectives led by the Divisional Police Officer, Maroko Police Station, CSP Isah Abdulmajid. The team had embarked on crime prevention patrol along Lekki-Ikoyi Link Bridge around 9pm on Saturday, March 9, 2019. 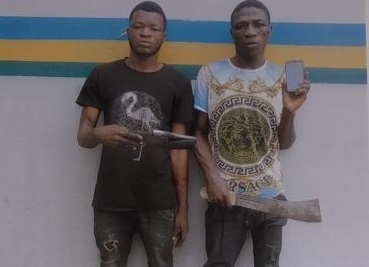 The team tracked down the suspects and upon searching them, their operational single-barrelled gun, a cutlass and the phone were found on them. The items were recovered, and the criminals taken into custody. Commending the police team for a swift response to the crime and the eventual arrest of the perpetrators, the state Commissioner of Police, CP Zubairu Muazu mni, directed that the case be transferred to the Special Anti-Robbery Squad of the command for further investigation. The CP assured residents of the state of the command's commitment to securing lives and property in every nook and cranny of the state. He warned criminal-minded individuals to change their ways or leave Lagos, noting that they risk facing the full weight of the law if they refuse.